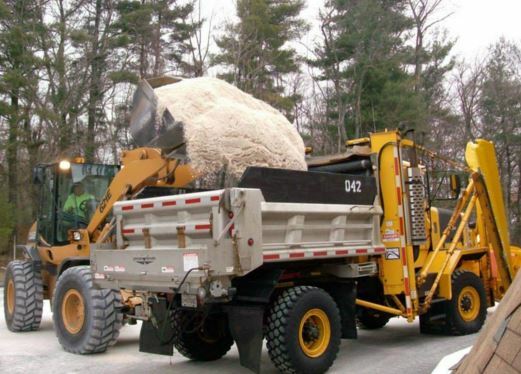 Bulk salting/sanding is one of the most popular services we offer in the winter months. The title alone can give you a pretty idea of what our bulk salting/sanding service is all about. In the article below, we shall shed more light on the nitty-gritty that goes into this side of our business. Why Provo Snow Removal chooses to use a combination of sand and salt during our snow removal process is because both materials have unique properties and ingredients that are vital in the snow removal process. Salt is great for melting the ice and can be applied on the sidewalks, and driveways to clear up the snow. On the flipside, salt can be hard on certain material such as cement and asphalt, and therefore it can compromise the structural integrity of your walks and roads. Very few people are willing to sacrifice the structural integrity of their property in the name of snow removal, and therefore, Provo Snow Removal uses a special kind of salt that does not impact on the quality of the ground. However, as the snow melts, the surface can become slippery and can lead to accidents. To ensure that the users, whether motorists, cyclers or pedestrians, move safely without the risk of slipping, we apply sand on the surface. Our mixture of sand is large enough to offer superb traction to the tires, and boots, and small enough to blow away with the wind and rain so that it does not leave a mess once the snow leaves. Our salt and sand combination for snow and ice works perfectly well as it ensures a maximum grip on the ground while melting away the slippery surface. At Provo Snow Removal, we have a sand and deicer mixture that ensure the maximum amount of traction is allowed on the surface, while at the same time melting away the hazardous conditions. StorageAt Provo Snow Removal, we have a road salt storage building that houses the mixture used on the roads and driveways. Our alt storage shed is constantly kept at the ready or any job that requires alt or sand. Instead of ordering specified quantities for just a given project(s), we have a salt storage dome and storage buildings that we store our salt and sand. As easy as you try to imagine, rock salt storage is not an easy task, especially during winter when the conditions are extremely humid, and there's a big chance that it might be destroyed by water and other elements. To avoid contamination from water, moisture, dust, animals and other contaminants, our domes are outfitted with bulk salt storage bins that protect the slat and keep it dry during storage and ready to use. Winter storms in Utah tend to hit on their own schedule, at our inconvenience. Provo Snow Removal is well aware of this, and this is why our bulk/salt bin storage are open 24/7, and we can get the job done anytime.